My first taste 1:18 GMP models. They are nothing short of great. This post wouldn’t have happened without the generosity of The Bell King, he ROAK’d this Ultra Red Auto World Ford Galaxie 500 XL - a chase piece - in our previous trade. It’s a been time since I’ve added any new 1:64 Auto World pieces into my collection, largely due to how they’re not sold in my region. When I was looking to trade away my green machine Hemi Cuda, The Bell King made me an offer I couldn’t refuse. Or as Tomica Limited Vintage-Neo calls it, the Toyota Cresta Super Lucent Twincam 24. Quite the mouthful, isn’t it? That’s all par for the course with getting long names and boxy design like the many Japanese cars produced in the eighties. No better day to showcase this TLV Datsun 510 from Mr. K’s selection. From the 1:43 stables of HPI Racing is this Nismo 400R in QM1 White, complete with all the scoops and vents to keep the beast within cool and under control. Release from the Mirage line, this tuned up R33 is made in resin. Dear Datsun fans, here is an auction for a Datsun 510 membership car that closes in 2 days. Happy bidding! Hello dear LaLDers, old and new, I’m Xin from Singapore and have been contributing to this wonderful community on and off for almost four years. Today is Singapore’s inaugural Diecast Expo, a key event I dare not miss. Through my lens, I hope to bring you with me on this visit. 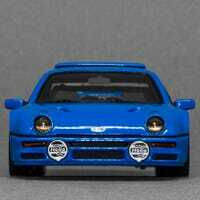 In this forced induction segment of Engine Week, I decided to dig up this Kyosho 1:43 Ferrari F40 from the archive. Almost four years ago, I wrote my first Concours d’Modella and was navigating in this new world of diecast photography. My love of HPI Racing scale models continues in the form of this blue 1:43 Lancia Delta HF Integrale Hi.Fi. This model replicates the extremely exclusive ‘HF Integrale Hi Fi’ version, of which only 20 examples were made for members of Lancia car clubs. This is my first ever Greenlight Green Machine I found in the wild. While I do like to have it, I believe there is somebody who will covet this more than me. Let’s work something out! For my silver choice for LaLD Car Week, I have this silver 1:43 Nissan R34 GT-R V-Spec from one my favourite scale model brands - HPI. Hailing from the MIRAGE line, this scaled-down Godzilla is a sealed resin model.